The best thing about a bug hunt is that it can be an ongoing activity that lasts a week – or more. Suitable for girls or boys, it involves a lot of educational know-how but is also an activity that is heaps of fun. Who knows, it could bring out the budding entomologist in your kids – and in you! Children as young as two can enjoy going on a bug hunt, and will even remember some of the scientific names of insects they are taught along the way. Never underestimate your children, and remember that if there is an older sibling along, your young ones will learn even more. Start by deciding beforehand which bugs you hope to find. Obviously, the insects you know exist in your area will be the easiest to hunt down. Go to your local library or bookshops to find lists of bugs you are likely to discover. Some bookshops sell junior insect kits that have laminated lists of common bugs, as well as a magnifying glass suitable for kids. A worthwhile investment for some children. Bring along a notebook to write down the names of the insects you find, and have your children draw their picture next to the names. If they want, they can just make a rough sketch which they can colour in later. Ask them to describe the insect to you and write down what they say, this will help them doing the colouring in later. Many bugs can be divided into two categories, either predators or pollinators. Predators are beneficial insects as they help keep down numbers of other bugs who can hurt the eco-system. Pollinators help flowers to reproduce. Many species of bee, wasp, moth and butterfly are pollinators, feeding on the nectar of brightly-coloured flowers. As they travel along they transfer pollen from one plant to another, helping them to reproduce. Ask your children if they can find pollinators and predators during their bug hunt. What kinds of predators do they see, and what is their role in the insect – and the human – world? Many insects are able to camouflage themselves in order to make themselves less visible to predators. A praying mantis and stick insect are just two examples of this. See how good your eyes are by looking for camouflaged insects during your bug hunt. 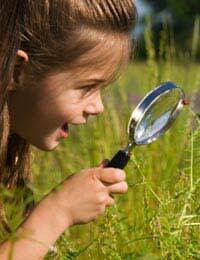 If your child shows signs of real interest in insects, turn his or her fascination into a hobby. A digital camera can capture insects on film, which can then be printed and put in a notebook or scrapbook. Your young entomologist may develop a hobby that lasts for life. Many schools require summer projects that need to be turned in at the beginning of the school year. A bug journal could be a suitable summer project for a younger child, or simply something to show during Show and Tell. Bug hunts are wonderful ways for children to learn about the world around us, and to appreciate how everything plays a role in the eco-system. Bug hunts can be especially helpful if a child is scared of spiders or ants, as they come to realise that even the humble cockroach is our friend. Happy hunting!